TREE OF LIFE – ALLELUIA! This digital design was commissioned as a banner for Concordia Seminary, Saint Louis, MO. Genesis speaks of the Tree of Life in the garden that held the knowledge of both good and evil and that became the vehicle from humankind’s fall from grace. The prophet Ezekiel declares that “the tree was beautiful in in greatness, in the breadth of its branches, for its roots went down to abundant water.” These words remind us both of the breadth of God’s great love for all people and of the Sacrament of Holy Baptism as the claim of God’s great love for each of us. The Book of Job reminds us that “there is hope for a tree, if it is cut down, that it will sprout again, and that its shoots will not cease. The Gospel writers introduce us to the cruciform “tree” through which Jesus the Christ overcame sin, death, and the power of evil in order to reconcile us to God. 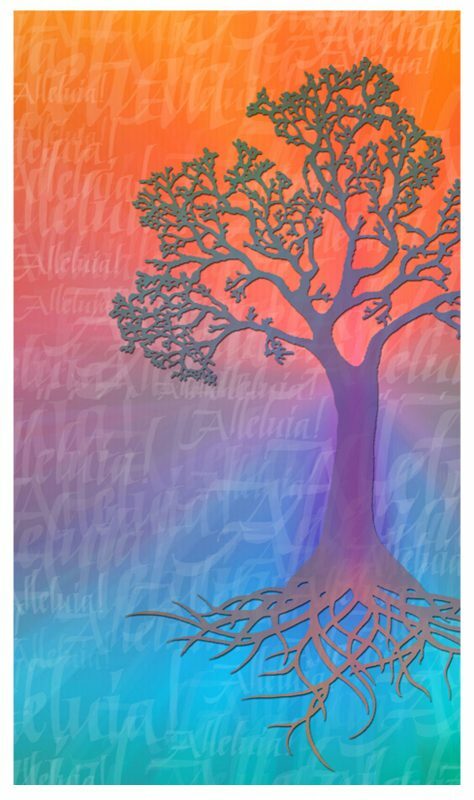 This digital Tree of Life motif gives voice to the “Alleluia” that praises God in all times and circumstances of the life/faith journey.